As one of the most popular catchers of all-time, Carlton Fisk cards and autographed memorabilia remain extremely popular despite being readily available. 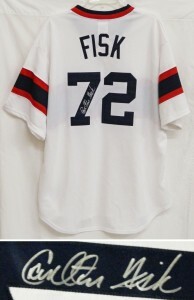 Fisk made his playing debut with the Boston Red Sox in 1969 and his final appearance with the Chicago White Sox in 1993. The 11-time All-Star was inducted into the Baseball Hall of Fame in 2000. Fisk was involved in one of the most memorable highlights in baseball history when, during the 1975 World Series, his demonstrative body language willed a ball past the left field foul pole for a home run and sent the series to a Game 7. 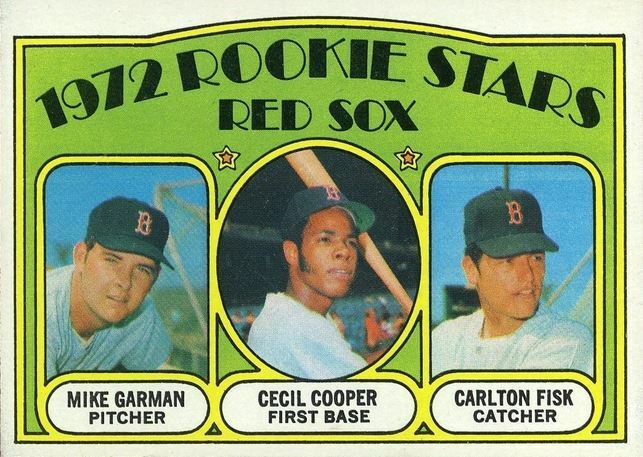 Although he made his debut in 1969, Carlton Fisk's rookie card would come three years later in 1972 Topps Baseball. Fisk also had a nearly identical card issued in the Canadian market by O-Pee-Chee. Additionally, Fisk appeared in 1972 Topps Candy Lids and a 1972 Boston Red Sox team-issued card. 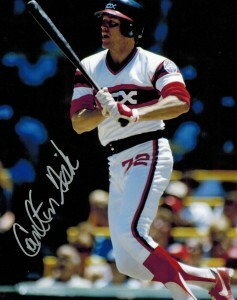 A frequent signer on the national autograph circuit, Carlton Fisk autographed memorabilia is plentiful. However, due to having played for two large-market teams for an almost equal duration, demand remains strong. The highlight of Fisk during the 1975 World Series is continually played, even today and as such, Fisk continues to develop new generations of fans. 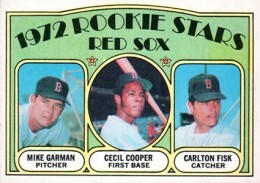 Carlton Fisk shares his rookie card with fellow Red Sox rookies Cecil Cooper and Mike Garman. The style of the 1972 Topps set has always been a collector favorite and Fisk's rookie is the key card in the set. Virtually identical to his Topps card, the Canadian O-Pee-Chee version features bilingual text on the back in English and French. As is the case with other O-Pee-Chee cards from the era, it's significantly rarer than Topps but it doesn't command much of a premium. 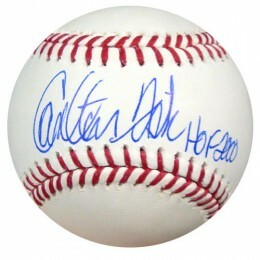 Below you will find an example of what Carlton Fisk's authentic signature looks like. This can be used as a first point of reference for determining the legitimacy of autograph memorabilia, but is not a substitute for having your items authenticated by a well-respected professional autograph authentication company. Some of the trusted sources within the sports memorabilia market include the following companies: PSA, JSA, Steiner, Mounted Memories and Tristar. Click on any of the images below to view full size photos. A rapid, flowing signature, unique and identifiable. Written in cursive with minimal stops and starts. The "C" contains a slight hook at the top and is almost closed like an oval, the bottom of the "C" curls up into the middle of the rest of the name. The pen lifts to write the letter "a" which is closed and flows into the "r" which has a small hitch in it making it almost look like an "n."
The convergence in the middle of the signature of the upstroke from the "C" the loop of the "l" and the cross of the single line "t" gets a bit convoluted but can be discerned upon inspection. The letters "o-n" are small with the "o" looking like more of an "a." The letter "F" is very unique. A short down/up stoke followed by a longer down vertical is then crossed at a 45 degree angle extending back and to the left of the signature. The "i" is implied, with the "s" being a narrow triangular shape. The signature finishes with a "k" that includes a narrow loop at the top of the vertical and the remaining lines resembling a connected "u." 2014 TOPPS GYPSY QUEEN CARLTON FISK JOHNNY BENCH AUTO BAT JERSEY 03 10 PSA 10!